Scientists discover underwater volcanoes in Hawaii that has now been switched off. The mountain was believed to have soaring to as high as 915 meters above sea level and was instrumental in the formation of the island of Oahu. 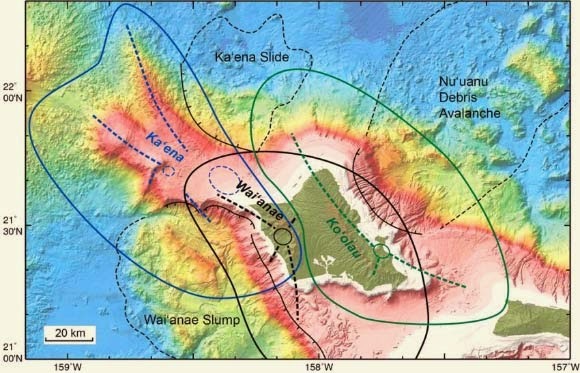 Based on research publication in the Geological Society of America Bulletin journal of this month, the seamount named Kaena it had been active 5 million years ago in the area between the islands of Oahu and Kauai. "Previously, we thought that we already know all the volcanoes in Hawaii. This is one that we do not know," said John Sinton, a geologist from the University of Hawaii at Manoa, as quoted by Reuters on Monday, May 19 2014. Oahu Island is the island where the capital and largest city in Hawaii, Honolulu, is located. Previously, Oahu believed to be formed due to the Waianae Mountains to the west and the Koolau in the east. With this discovery, scientists obtained clues that Oahu has another mountain to the west, namely Kaena. This newly discovered mountain over time "sink" below the surface of the Pacific Ocean. Though Kaena was first formed mountain, geologists estimate that Waianae first surfaced about 3.9 million years ago. Kaena then surfacing 400,000 years later, followed Koolau 500,000 years later. "Three million years ago, a third of the mountain appears on the surface," said Sinton. "The islands there always has decreased despite a growing surface. Once stopped erupting volcanoes, mountains will sink. Kaena We do not know when it sank," he added.